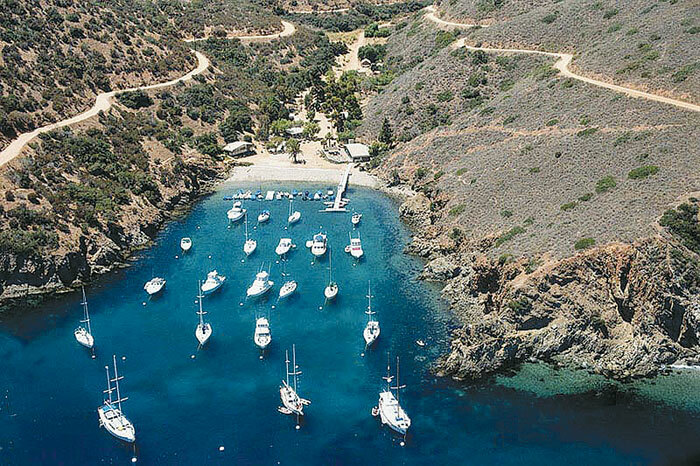 TWO HARBORS — Santa Catalina Island Co. and Fourth of July Yacht Club have signed a new long-term agreement for the use of Fourth of July Cove that will result in improvements to the onshore facilities and open the cove to the boating public. Fourth of July Cove is located adjacent to Two Harbors on the West End of Santa Catalina Island. Under the new agreement, Davidson said yacht club members will maintain their ability to use the cove as they have in the past, while also providing a partner for the club to help with upgrading and maintaining the cove facilities. “And it creates an opportunity for others to enjoy a very special place,” he said. The agreement has some interesting provisions, granting the club year-round use of the premises with unchanged priority access in the prime summer season (April 15 to Oct. 15) and shared use during the under-utilized winter and spring months. In an effort to generate business for Two Harbors and provide greater opportunities for small groups wishing to visit Catalina during the off-season, the Santa Catalina Island Co. will begin marketing the Fourth of July Cove and its facilities during these months as a destination for large family reunions, corporate retreats, yoga groups, hiking clubs, scuba diving clubs and other similar market segments. Facilities at the cove include a large dining room, a deck and a commercial kitchen that can serve meals for up to 125 people. The cove can also accommodate up to 55 guests overnight, in cabins and tents with cots. The facilities include separate men’s and women’s shower and bathroom buildings, a children’s pavilion equipped for games and movies at night, and paddle tennis, volleyball, bocce ball courts and a pier. The Santa Catalina Island Co. plans to help upgrade some of the cove facilities and has committed to certain capital improvements over the next 18 months. Previously, the on-site club manager and yacht club volunteers were performing almost all of the work necessary to maintain the expansive facility. Fourth of July Yacht Club was founded in the late 1950s when several yachtsmen signed an agreement with the Santa Catalina Island Co. to lease the cove and its facilities, after the Girl Scouts relinquished it. By the mid-1970s, the group had gained enough members to become a nonprofit corporation. The Banning Family, who owned the island from 1894 to 1919 and built a home in Two Harbors that now serves as the Banning House Lodge, gave Fourth of July Cove its name after picnicking at the cove adjacent to Two Harbors. Visiting and recreating at the beach and cove was one of the family’s favorite traditions. The new agreement has an initial term of seven years plus an option for an additional five years, making it potentially effective through Dec. 31, 2024.